Pikachu, Bulbasaur, Meowth . . . Puzzled by Pokemon and the international buzz it has created? 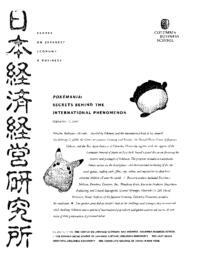 On February 7, 2000, the Center on Japanese Economy and Business, the Donald Keene Center of Japanese Culture, and the East Asian Institute of Columbia University, together with the support of the Consulate General of Japan in New York, hosted a panel discussion featuring the creators and packagers of Pokemon, The program included a multimedia demonstration on the development and international marketing of the electronic games, trading cards, films, toys, videos, and myriad tie-ins that have attracted children all over the world. Featured speakers included Tsunekazu Ishihara, President, Creatures, Inc., Masakazu Kubo, Executive Producer, Shogakkan Publishing, and Takashi Kawaguchi, General Manager, Nintendo Co. Ltd. David Weinstein, Shoup Professor of the Japanese Economy, Columbia University, served as the moderator. The speakers provided an insider's look at the challenges and strategies they encountered while building Pokemon into a symbol of international pop culture and global commercial success. A summary of their presentations is presented.